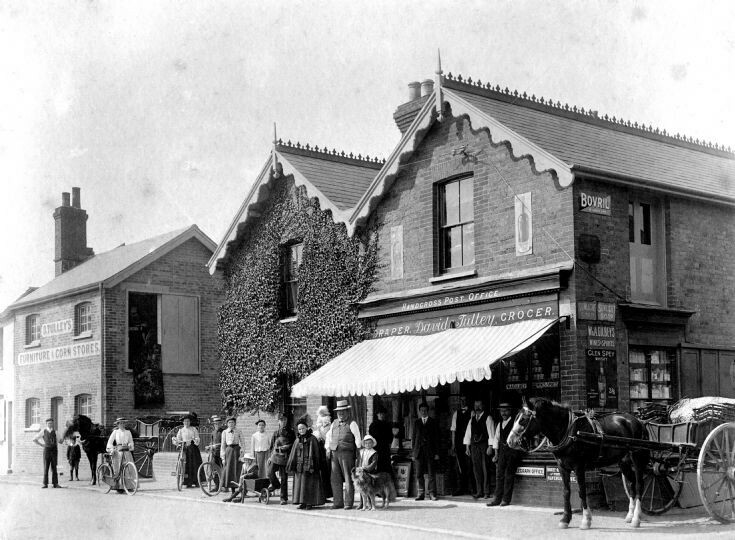 This is the first of four pictures relating to the village shop; Tulley's Stores and its successors. Staff, family and customers have gathered outside David Tulley’s Post Office and Stores to have their picture taken. Standing in front of the window to the left of the awning is a postman with a leather satchel hanging around his neck. Just to his right is a young man with a similar jacket and perhaps he is the telegraph boy. Of the three men in waistcoats standing in the doorway, the one of the left appears to be carrying a yardstick and he would work on the drapery counter located on the left inside the shop. However, perhaps the layout was changed between the date of the picture and my first visits to the shop in the early 1940s. Similar photographs of the shop can be found at picture #113, picture #114, and picture #115. The shop was later taken over by Ralph and Harold, the two sons of David and Florence Tulley. Ralph Tulley went on to marry Ena Victoria Anscombe in 1924. In her “Recollections and Reflections of one born in Slaugham Parish” she writes of the Post Office. Beneath the head of the horse on the right is a “Telegraph Office” sign indicating a mode of people keeping in touch, more-or-less instantly, by the sending and receiving of telegrams. The invention of the telephone and later, the smart phone, put an end to telegrams. And telegram boys! In a facelift to the Post Office externally in about 1960, the signage workers were disposing of superfluous signs and my father, Roger Ray, was quick to make sure the sign was saved. The central part was metal with an enamelled finish. The wooden surround is a bit wobbly but the metal is almost like new. Select Open Document to view the sign today.